LP0351. 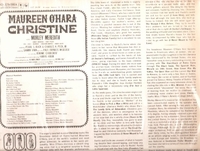 CHRISTINE (Sammy Fain), Original 1960 Cast Recording, w.Maureen O’Hara, Morley Meredith, Nancy Andrews, Janet Pavek, Phil Leeds. Columbia stereo grey label OS 2026.